Red meat can be part of a healthy diet when you choose leaner cuts. In the past, eating red meat and processed meats like hot dogs and deli meats was thought to increase risk of heart disease and diabetes. Recently, these two types of meat have been looked at separately. It seems that processed meat, not unprocessed red meat, is responsible for increases in disease risk. There have always been good reasons to eat meat, including red meat. For example, meat is a great source of protein and provides well-absorbed iron and B vitamins. Eating too much fatty meat can increase disease risk because of high amounts of saturated fat and cholesterol. 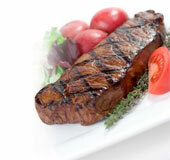 If you choose lean meats you may be able to enjoy red meat without extra risk of disease. How do you know if meat is lean? Choose meats with 10 percent fat or less. Learn to interpret the numbers that tell you the percent lean tissue versus fat. For example, “93/7” means 93 percent protein and 7 percent fat while “80/20” means 80 percent lean and 20 percent fat. The leanest cuts of meat are round steaks, top loin, top sirloin, chuck shoulder and arm roasts. Select choice cuts of meat. Prime cuts typically have more fat. A serving of meat is about 3 ounces or the size of a deck of cards. The recommended amounts are slightly different for women (5 to 5.5 ounces per day) than men (5.5 to 6.5 ounces per day). To keep your red meat choices lean, trim off any visible fat. If you’re cooking a fattier cut of meat, drain off the fat that develops when cooking. Add spices to meat and marinate instead of high-fat sauces or gravies. Add dehydrated onions or mushrooms to ground beef. They will absorb moisture, preventing its loss. Add flavor and moisture to burgers by mixing ground beef with barbecue sauce or balsamic vinegar. Cook lean meat in a skillet where it can sit in any juices that leak out. Let meat sit 6-10 minutes after cooking before cutting or eating. This allows the moisture to saturate the meat. Otherwise, you will watch the juice pour out upon cutting. Put all the ingredients in a crock pot, and you’ve got dinner ready at the end of the day. 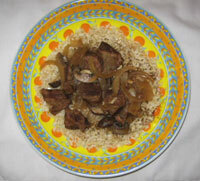 Place meat and onions in a crock pot. In a small bowl, mix the garlic, ketchup, Worcestershire sauce, sugar, salt, paprika and mustard. Stir in 1 cup of water while mixing. Once mixed well, pour over meat. Cover and cook 9 to10 hours on low heat or 5 hours on medium heat. In a small bowl, mix flour with 1/2 cup water. Add to the pot with the meat and stir to thicken. Add mushrooms. Cook on high heat for 10 minutes or until thick.